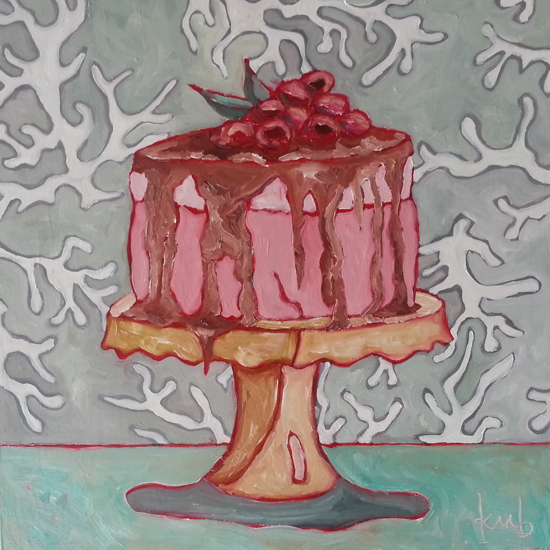 Katrina Berg is the most calorie-rich Mormon painter since Wayne Thiebaud. 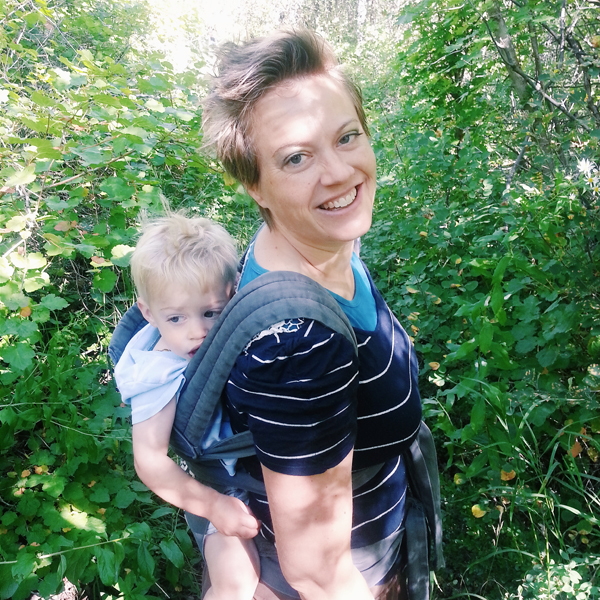 Berg lives in Utah with her husband and five kids. 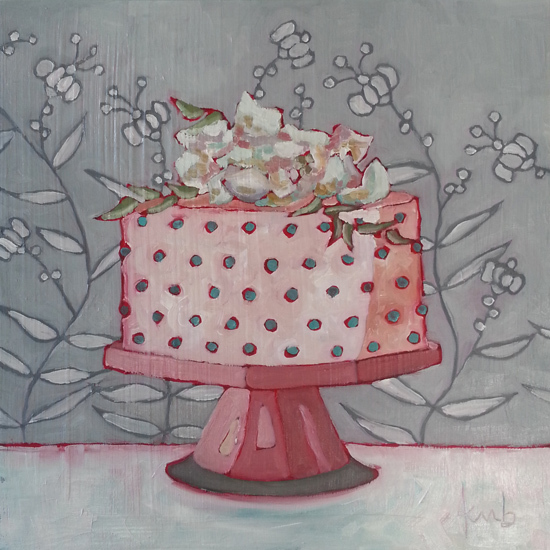 You paint a lot of cakes and cupcakes. Tell us about it. 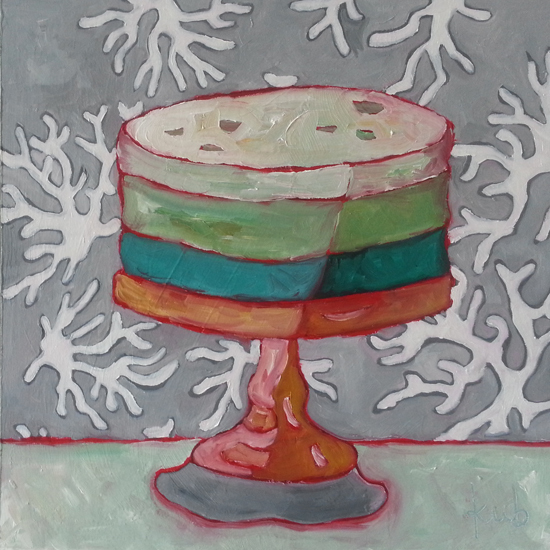 “A bite or taste is much like a memory: frozen in time and cataloged with those things we whole most dear.” Most of the cakes have a story, or represent experiences of friends and loved ones. One portrayed the cheesecake I craved incessantly when I was pregnant with our twin boys. 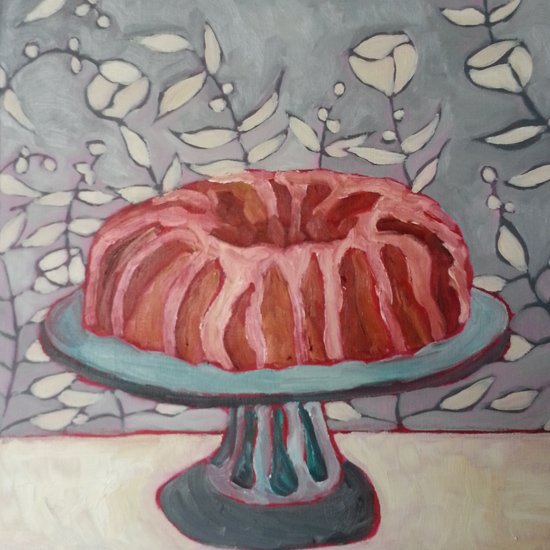 Another represents a friend who would make us a Bundt just to keep us going when she knew we were simply surviving. Still another depicts the wise mother who told her son to bring home flowers to his wife and to not give up on their marriage. Most celebrate sweet moments or things others have taught me. Sometimes they are not always happy memories…but a sweet learning experience none-the-less. Life isn’t always yummy, but there is always that gesture or a sweet bite that lifts our spirits and makes us smile…at times it’s just what we need to endure one more moment. Do you have a favorite restaurant you frequent on vacation or return to for a special event? Maybe the food is not the best, but the people or celebration made the food that much sweeter? 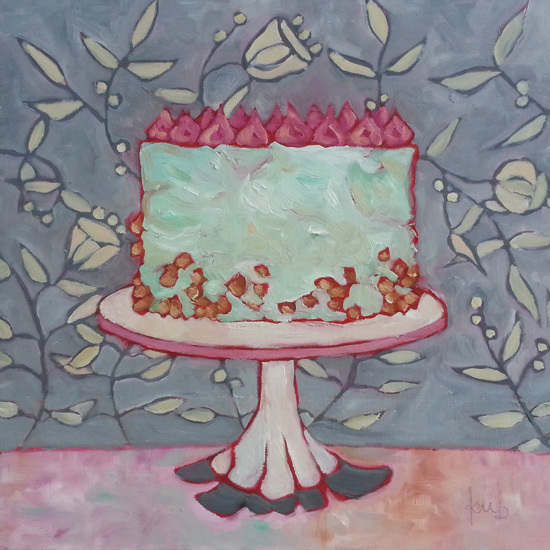 These cakes are meant to encapsulate these types of experiences…and to welcome new ones. You studied at UNLV and BYU, studied abroad in France and Italy, and studied landscape architecture among other things. How do these disparate parts shape your art? One of my best friends in architecture school, and later roommates while we studied Italian gardens and hill towns, gave me my first set of paints for my birthday. I was 25. Like many artists, I was a compulsive doodler (is that even a word?!). Traveling and living abroad changed my perspective so very much and the only way I knew to express what was radiating from within was to paint. I’ve always been interested in so many things, searching for beauty as my personal quest. Painting has helped make sense of my journey and helped me express these discoveries. In most pieces you’ll find natural elements within the wallpaper or textiles in the backgrounds of my still life and interiors. The desire to bring the outside in began with my landscape architecture studies. Living in Northern Utah changed that desire to a need…as we’re blanketed in Winter-white goodness, I love to enjoy a bit of “green” in my art. Life has been a series of pretty remarkable challenges from ‘Forrest Gump’ leg braces, infertility, and severe allergies to abuse when you were a child. How did these experiences shape your faith and your creativity? The two greatest gifts that I have personally been given are the Lord’s Infinite Atonement and Empathy. There are so many that have suffered far more than I and I remember that often. Yet, I feel so very grateful to be able to help a friend through a similar challenge…it can be such a lonely road these trials of ours. I’m constantly reminded that these experiences come with obligations…to learn something, to become stronger in our faith and testimony, and to help others. This life was never meant to be faced alone, and sometimes the only people who truly understand what we are up against are our Savior and Redeemer, and those who’ve overcome. Without these challenges, how willing would I be to accept and better understand the gift of the Atonement? His grace is truly sufficient for all and covers all…knowing how much He loves us and the joy He and our Father in Heaven feel as we serve and lift one another brings me joy. Life is messy and life is hard. And yet, we as artists have the opportunity to serve, lift, teach, and offer beauty as we create. There is good all around and I feel it is my quest to celebrate this good as I paint. You and your husband built a green home. What is your studio like? What is your work style? Concrete tilt up walls and floors act as a thermal mass to capture the heat, warming our home in the winter and cooling it in the summer, where floor-to ceiling windows provide passive solar heat. These large windows offer an abundance of natural, non-direct sunlight wherever I paint. I have a studio adjacent to our bedroom that I’m currently sharing with our twin babies. Getting twins to nap and sleep through the night has been a full-time job, so I’m currently painting in our dining room lol. 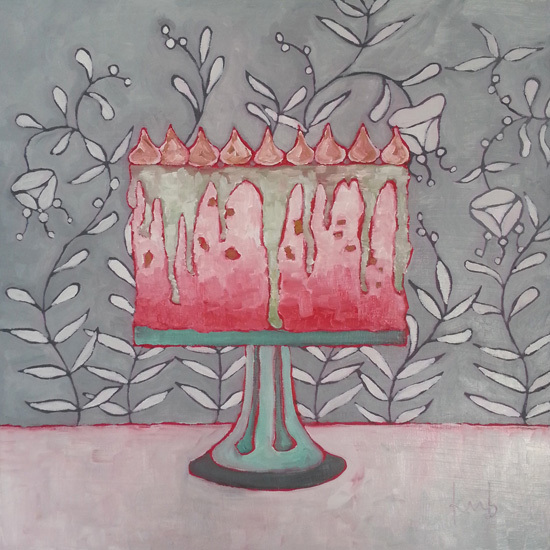 Last summer I temporarily painted at a large table in our living room…they have all had great lighting, we just adapt, seeking what works best for our family. One day the twins will move in with their big brothers and we’ll finish the two-story greenhouse…and then I’ll be able to open the double glass doors from my 2nd story studio and let in the aroma from the plants and fruit trees growing within. One day… Till then, I consider myself a “dream painter”, primarily painting as the babies sleep. My husband and I schedule studio time for me a couple nights a week or weekends. I hire babysitters and have a dear friend who volunteers to take my 5 kiddos every so often so I can paint. During these studio sessions I make every moment count and don’t let anything like emails or my phone deter me from my precious painting time. I’m so thankful to all that help and support my passion. Follow Katrina Berg on Instagram.